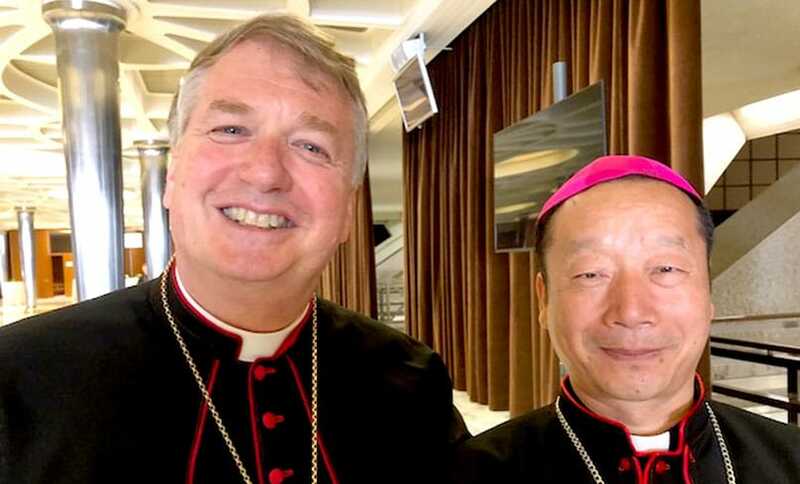 Archbishop Anthony Fisher OP with one of the two bishops from mainland China who are attending the Synod. 1. “Meaningful questions and sensible answers” rooted in Christ who is the Way, the Truth and the Life of young people. This was the call of the first circle. Inter-generational relationships, its members observed, are developed by one generation daring to trust the other. Young people need accompaniment with respect to affective-sexual life issues, media, education, family fragility and migration. Listening, empathy and integrative approaches – a ‘Synodal Church’ – are needed. A final message from the Synod to young people was recommended. 3. In some countries a large proportion of young people are disengaged from the Church. We must hear their implicit challenge and consider the implications for our perennial salvific mission. The Church needs modern witnesses. Pastors need formation in the situation of youth today and effective ways to engage them. We must be willing to discuss sexuality with young people in a more open way and this small group recommends a document on this. In other countries the focus will be more on the needs of migrant youth. 4. Any Synod document should commence not with sociology but with the icon of the Emmaus story. Only then will the see-judge-act model work. The Instrumentum Laboris (the Synod working document) is too negative, focussing on problems when we should instead give many examples of success with young people. The Instrumentum Laboris is very Western and does not sufficiently address youth in poorer and developing countries. Young people need both spiritual maternity and paternity. The reflection on digital culture in the Instrumentum Laboris should be better integrated, recognising that digital migration to the e-world creates rootlessness like that of those moving between continents. This group also felt that the Instrumentum Laboris understimated child sexual abuse as a force undermining relationships with young and efforts to evangelise them. The strong emphasis in the Instrumentum Laboris on listening to the young might appear to diminish the Church’s teaching role, but there is no necessary tension between listening and teaching.The Restless heart of Emmaus story and St Augustine might be used as a leitmotif (or a light, recurring theme) for our document. 5. Faith in a Christological framework is important not just for moments of interpretation and choice but also in the prior moment of recognition. Part I of the Instrumentum Laboris, it was felt, was negative in its approach. The ambivalent values of the new media are a clear problem for the young . Our teaching on the human person, the body and chastity needs to be presented clearly to the young who are desperate for moorings – something they can trust. We cannot skim over child sexual abuse in a few sentences (as in the Instrumentum Laboris) which has undermined so much of what we would like to do with and for young people. We must also rebuild trust, one person at a time, by letting the Church be seen in her authenticity and fragility. The dichotomy between young people and the Church is, at one level, false as young people are also members of the Church. 6. There are great differences of context among young people in our world. Many pressures on the young compromise their ability to discern clearly and experience genuine joy. Meaning of corporeality, sexuality, intimacy in a digital world needs fuller treatment than presently in the Instrumentum Laboris. There is a need for a more penetrating critique of digital world. 7. The Instrumentum Laboris speaks too often of young people as if they/we are outsiders to or rivals with the Church. The document to be produced by the Synod, it was felt, must be more Scriptural, much shorter, more accessible and more positive than the Instrumentum Laboris. We need to focus more on the positive experiences many have of family life and Catholic schools. It would be helpful if we are clearer about the difference between a job and a vocation. Many terms or sentences us in the Instrumentum Laboris are unclear or will confuse readers. There is also, the group felt, too much ecclesial self-flagellation in the document. 8. This group joined others in critiquing what might appear as a lack of focus on God, Christ and the Holy Spirit in Part I of the Instrumentum Laboris; the Jocist methodology need not mean being secular in the recognition moment of the process. Young people today need education in motherhood and fatherhood as their own experience may be limited or negative. Family ministry is one of the best ways to help youth. Our schools must be faithful and evangelical and pastoral. As with other groups, this group thought that points 52-53 of the Instrumentum Laboris on the body and affectivity need major reworking. 9. It was also obsevred that the value of World, National and Diocesan Youth Days are very powerful. Parishes can also use recreational and sporting opportunities to connect with the young. Christian anthropology and sexuality need a fuller treatment. There was some discussion of the possibilities of adapting the liturgy to attract the young. It was suggested Episcopal conferences might use the Instrumentum Laboris and final document as a checklist. 10. An accessible message to young people is recommended alongside the major document. The Word of God – especially the Emmaus story – should frame the document. Young people are not outsiders to the Church (but, this group felt, the Instrumentum Laboris regularly talks as if they were another religion with which we are in interfaith dialogue, or from a country that has not yet heard the Gospel). Accompaniment is not just about approval but about enabling conversion as well. Another issue raised was that often the adults known to young people are not themselves credible witnesses to the Gospel. Meanwhile, in individualistic cultures salvation can be too easily reduced to nothing more than a form of psychological therapy. 11. The sheer range of young people was also emphasised: they are not a homogeneous demographic. This group sensed the overlap with previous Synods, because the quality of family also shapes youth. The final product of the Synod should be a different kind of ‘document’ to that of other Synods – more accessible, visual, direct. There were also discussions of youth poverty, digitisation, enclosure in restricting bubbles and the illusions of false freedoms… the Church as Mater et Magistra (Mother and Teacher), it was felt, must confront languages and cultures that are highly resistant to the transcendent. The Church needs to address issues of high tech developments, inequality and disability. 12. Church’s seeing and hearing of young people, this group felt, must be done as Christ looked at and heard them – through His eyes, rather than in a neutral way. The Church as Mater et Magistra (Mother and Teacher), it was suggested, listens and speaks to the young. As with other groups, this one sought greater attention to and focus on the importance of the family (as the stable union of a man and a woman open to nurturing children) for the formation and support of young people. Migrant youth, it was suggested, need evangelical hospitality from us and should not be seen as a threat. Young people are scandalised by divisions within the Church, it was observed, yet we cannot even agree on when to celebrate Easter! It was also observed that the young respond to powerful ecclesial moments, but there must be follow-up. 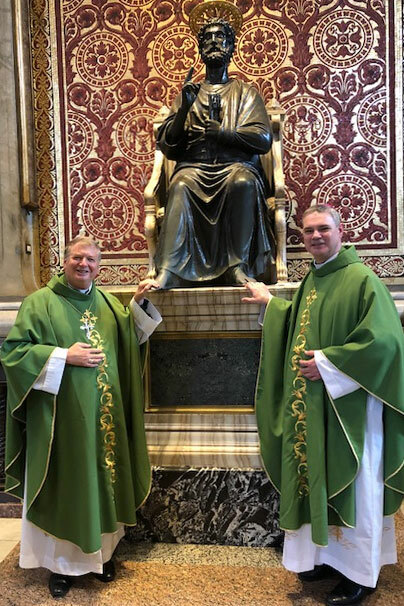 Archbishop Anthony Fisher OP with the Archbishop of Melbourne Peter Comensoli in Rome this week. 13. This group focused on how the Synod might better communicate its message (for example, via short reports, videos, a letter directly to young people, an apostolic exhortation with study Guide etc.). It was suggested that the Instrumentum Laboris is too negative and neglects the role of young people as protagonists in the new evangelisation rather than seeing them only as passive recipients and that the document needs a section on the importance of friendship. 14. Young people need a compass today more than ever, and a basis for community integration. This group focused on needed principles of discernment, such as Christian joy, inter-generational relationship, integrity of the person and affectivity, the inclusion of outsiders and liturgical beauty. Is there a Search-For-God engine? After the morning session I had a meeting of the Communications Council and there I met the two Chinese Bishops who are attending the first Synod with Mainland Chinese representatives. I told them my mother was born and grew up in Shanghai. It turns out that despite the new ‘concordat’ with the Vatican and that these are government-approved delegates, they are only permitted to attend half the Synod. Sad, but better than nothing. This afternoon the drafting group for the Synod was elected. Because I am on the Communications Council I was not eligible for election. I’m happy to say Archbishop Peter Comensoli was elected to represent Oceania. Well done! – The importance of helping the young to cultivate ecological awareness, a sobriety that resists consumerism, a spirituality that generates deep joy without endless consumption and a liberation from waste.